Wiliwili Park Project - In 2007, four large and very old Wiliwili trees were found on a commercial project in the village that was being developed. WVOC consulted with the developer and arranged to have three of these trees moved to the Waikoloa Road median. The fourth tree was moved to the corner of Paniolo Avenue and Lua Kula Street. Mike Haskins of Pure Paradise Landscaping took what once was a barren corner and created an innovative design to complement the relocation of this tree. Russ Trucking did the site preparation with his bobcat and the striking rock walls were completed by Waikoloa Rock Walls. The curbing was done by Island Edge Curbing. Laser On, Inc. of Kailua-Kona, Hawaii, donated the laser-etched interpretive sign and Marshall Stutts installed it. Wiliwili Park was chosen as the name for this corner. Keiki Playground at Ho'oko Street Park - This project, begun in late October 2009, was completed and dedicated to the County on December 23, 2009. Hundreds of volunteers contributed thousands of hours and area business donated thousands of dollars worth of equipment, services and materials to make this playground a reality. What was once an empty field is now a wonderful play area for keiki from Waikoloa and beyond. Improvements included three pavilions for shade and family gatherings, a custom-designed and built replica of a fire truck, two sets of swings, a climbing tower, a monorail, tetherballs, a tire swing, a “Bing Boing” and a tube slide from the top of the hill above the playground into the playground itself. Dry Forest Recovery Project - This “forever” project for WVOC is its most ambitious. With the blessing of the Waikoloa Village Association, WVOC has undertaken the stewardship of 275 acres within Waikoloa Village. This community-based effort will preserve and restore a very special and unique Wiliwili (Erythrina sandwicense) dry forest that is currently home to 13 endangered Uhiuhi (Caesalpinia kavaiense) trees and approximately 80 Wiliwili trees. There are fewer than 30 wild Uhiuhi remaining in the world. Cost share grant programs provide reimbursement for volunteer time, labor, materials and equipment. As students, community work crews and visitors volunteer to clear invasive species and plant native species, fencing of the parcel continues, with almost half of the enclosure already in place. When fencing is complete, planting native dry forest species can be done without having to protect each plant from feral ungulates with individual wire enclosures. Future plans include nature trails and education programs, such as the Waikoloa Future Foresters Program. 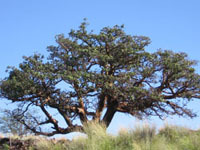 For more information about the Waikoloa Dry Forest Recovery Project, you can email the WVOC or call them at 808-883-3362. Here is the link to the projects website. Waikoloa Future Foresters, a Generation of Change Begins with a Single Seed - This project is an idea brought to fruition through the efforts of Dave Faucette, Waikoloa Dry Forest Project Manager, Beverley Brand, WDFRP Committee Chair, Sylvie Bright, MA, a teacher at Waikoloa School, and the WVOC. The youth in our community are actively participating in the Waikoloa Dry Forest Recovery Project, learning about dry forests in the classroom and practicing what they learn in the field. It is our dream that, in years to come, the Waikoloa Future Foresters of today will work side by side with future generations to continue this project in perpetuity. Waikoloa Wiliwili Festival - . The first annual Waikoloa Wiliwili Festival was held on August 28, 2010. This event, which celebrates the blossoming of the wiliwili trees in Waikoloa, is a day full of fun for the children, live entertainment and food and arts and crafts booths for the adults and education for everyone. Take a look at some photos taken by Debrasue Stutts and others.